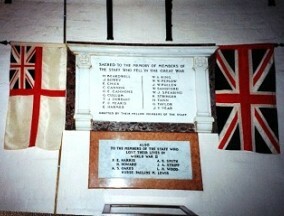 As part of plans to mark the centenary of the First World War, the Bourne Society initiated a project to move the St. Lawrence’s Hospital Staff War Memorial, originally in the hospital chapel, from Caterham Cemetery, where the stone is badly eroded, to a place of honour inside St. Mary’s Church (South Aisle rear wall). Reverend Duncan launched an appeal during his sermon on Remembrance Day 2013 and applied to the Diocese for a Faculty, which has since been granted. Donations from the local community, the Bourne Society and Waitrose Community Fund, together with a large grant from Caterham Hill Parish Council will enable the project to happen. The First World War Memorial was cleaned and installed inside St. Mary’s Church and rededicated at the end of the Remembrance Day Service on 9th November 2014. The background to this project may be of interest. The Caterham Metropolitan Asylum opened in September 1870 to provide healthcare for ‘insane paupers’ living in workhouses in London. In 1941 it became known as St. Lawrence’s Hospital after the parish in which it stood. By the time of its closure in 1994 there had been great changes in the care of people with mental health/learning disabilities. The hospital was a significant feature of Caterham life touching the lives of many local people. Mick Burnell’s research showed that 131 men of the hospital staff volunteered for duty during the Great War and 20 were killed in action or died of wounds. After the First World War the staff of the then Caterham Asylum erected a memorial to those staff who lost their lives: two people are not listed. After the Second World War, a plaque was added to commemorate those who died in that war. 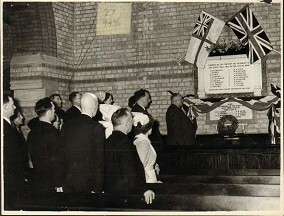 The picture shows the memorials at the unveiling of the 1939 – 1945 war memorial in the hospital chapel. 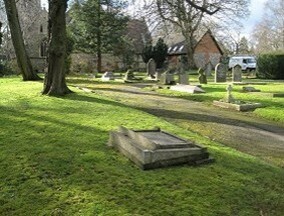 When St. Lawrence’s Hospital, including its chapel, was finally demolished in 1996 the memorial was moved to near the Garden of Remembrance in Caterham Cemetery behind St. Mary’s Church. Members of the Bourne Society and the Caterham & District Local History Centre have been researching the whereabouts or fate of the Second World War Plaque for many years but the mystery is unsolved. All that remains is a stone bar stating “1939 – 1945 War Memorial from St. Lawrence’s Hospital Chapel”. If the original plaque is not found it will be replicated once further funding is available.